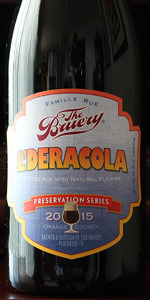 L'deracola is a beer inspired by another favorite drink of ours that probably shouldn't be such a favorite... cola! To create this unique beer we had to dive through the overwhelming layer of saccharine that dominates the flavor of most colas and discover the subtle flavors that create the world's most popular soft drink. Around a dozen different spices were added to a dark malt base and it was finished off with a twist of lime for good measure. The resulting beer has all of the flavors of an ice cold cola, without the overwhelming sweetness. Delightfully refreshing on it's own, but also ideal for a modern take on a classic style cocktail. Very delicious soda beer. Drinkable for a geek or noob. Would be great in a cocktail but leaves a bit to be desired in terms of carbonation. I already would like to see an imperial version as well as imperial barrel aged. Worth a try. Cheers! This beer lives up to its billing. It smells like cola, tastes similar to cola, and is refreshing like cola. 750ml bottled poured into a pair of snifters. The brew appears a dark cola brown color with a creamy khaki head. This smells exactly like coke. Honestly, ive had alot of beers that were designed to mimic something else and this just nails it. Im strangely impressed by how much this smells like soda. This is light in body with moderate carbonation. I gotta hand it to the Bruery, they definitely nailed the cola aspect in the nose and taste was close. But lets be honest, if someone wants a cola, they are not reaching for this instead. Cut the horseshit with these mocktails and things designed to taste like anything but beer and get to work on making the beers we all have come to love/want more of. I had really high hopes for this one. I'm a big soda fan and like the idea of a cola themed beer. This just didnt hit with me though. Lime was very heavy and to me it tasted more like a flat mess. That said, A for effort. Had this one twice; didn't think much of it the first time, but really enjoyed it the second. I think I was judging it too much based on how close it was to actual soda the first time (it really isn't close...unless you mean flat soda), but the second time around I appreciated it for what it is. The spices come through nicely and there's some hidden complexity that I missed the first time. Overall, I've found their "other drink series" (including horchata, cola, and a cocktail) to be underwhelming, but a fun experiment. Maybe they'll hit on a great one eventually. 750ml capped bottle into a Cigar City snifter. Shared with schen9303. Pours coke-like. A .5 finger light cream colored head with moderate retention (soda head collapses quickly). The color is exactly on point. Clear and dark brown. Lacing is very stringy and sparse with little stick. Solid. Nose is just like coke. Sweet, effervescent and with that twinge of tart carbonation that tickles the nose. Opens tart and moderately sweet. Some residual sugar lingers in the back but there's an awkward bitterness and sourness that throws the experience completely off. I can see where they were going with this... but along the way, something went really wrong. Finishes sweet and a touch tart and bitter with hints of brown sugar, caramel and nuttiness. Tart aftertaste. Strange. Light bodied with moderate carbonation. Prickly and foamy in the mouth and goes down filmy. Messy finish with a lingering aftertaste. Pretty much like coke. If you're gonna do a soda beer, it better be very good since beer people drink beer.... often because they like the taste of beer.... If you're going just by the nose and feel, L'deracola is on point. Its just right... but something has gone horribly wrong with the taste here and this make the beer nearly undrinkable. 750ml into stemmed glass. Bottled 4/21/15. A: The pour definitely looks like the color of cola with that characteristic caramel coloring. Head is dense, tan, and nice and fluffy with a good three fingers foaming up after the pour before fadeing into a very thin collar. S: Smells strongly of a spice rack with nutmeg and clove being the most noticeable. The spices are dominating and do not necessarily scream cola. T: Strange combination of spices mixed with dark and caramel malts. Flavors are similar to a craft cola or maybe rootbeer, but overall it's just a spice rack bomb. Nutmeg and clove are noticeable along with maybe some all spice. Tastes a bit woody as well or root-like, with a touch caramel and vanilla in the finish. M: Medium-full body, cola-like carbonation but maybe a bit softer and denser. Bittersweet mouthfeel with a chalky finish. O: Tastes like a stronger version of an Anchor Xmas beer. Very spice forward. Not something I could drink a lot of, and not very good overall. Tasted similar to cola, but less sugary and more gingery. It served as a nice palette cleanser in our beer tasting. Definitely looks like cola. Fizzy and dark. Small is pretty spot on too, just with a bit more lime. Taste is where it gets weird. After reading other peoples' reviews, I agree with both sides of opinions. I can see this tasting a lot like cola, and I can also see why people would think this tastes nothing like cola. I personally dig this beer. Wish it tasted a little less ginger/limey. Otherwise, a beer worth trying. Very interesting. Grassy spices, poor balance, not all there. The finish as this odd after taste. Pours an almost opaque crimson-brown with a foamy dark khaki head that settles to wisps of film on top of the beer. Tiny dots of lace drip into the remaining beer on the drink down. Smell is of generic cola, lime juice, lime pulp, earth, and spice aromas. Taste is much the same with generic cola, lime zest, lime juice, spice, and toast flavors on the finish. There is a mild amount of toast bitterness on the palate with each sip. This beer has a lower level of carbonation with a slightly crisp and dry mouthfeel. Overall, this is a good beer with distinct and unique cola flavors upon each sip, but the aftertaste is definitely more beer like to me. A - Poured into a Kate the Great tulip a dark brown hue with a fat two finger head that fades to leave thin blanket. Very soda like. S - Aromas of a spicy soda. Almost root beer like. Or sasparilla. No actual malts either, just sugars. Really interesting with nice light fruitiness. T - Taste is similar to to the nose for a moment. Sugary sweet, incredibly bitter on the finish. There are lots of spice notes, almost wormwood like, oaky, odd dried berries (talking botanicals). Drinks boozy too, quite syrupy. M - Mouthfeel is brightly carbonated, sticky, soda like. O - Overall this beer started very nice on the nose, however, the taste is way too sticky and sweet with very odd spice notes.